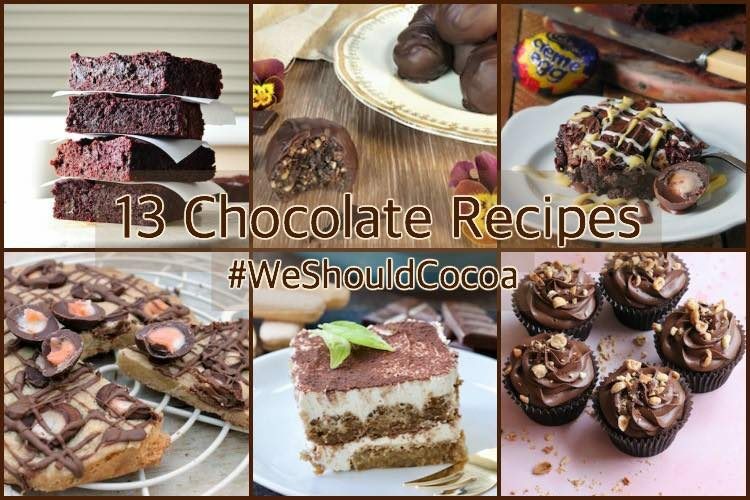 If you’d like to join in with next month’s #WeShouldCocoa, scroll down to the bottom of the post and you’ll find the March link-up. If you haven’t joined in before or need a reminder, you can find the guidelines on the We Should Cocoa page. How about this gluten free dark chocolate whiskey cake from How to Cook Good Food to kick things off? It has a truffle like centre, is made with ground almonds and sounds absolutely sumptuous. Just look at the rich colour in these beetroot coconut brownies from Everyday Healthy Recipes. Beetroot is not the only healthy ingredient however. Head on over to find what else they contain. Brownies are always popular. Here we have these rather wonderful sounding browned butter nutella chocolate chip blondies from Something Sweet Something Savoury. If brownies and tiffin are on offer I’m never sure which one to try. I find them both irresistible. Here’s a special one to show the love from Foodie Quine – Valentine Rocky Road. I know someone in this household who would love me to make this perfect eggless tiramisu from Jo’s Kitchen Larder. I won’t give away the secret, but this version does sound rather lush. We have homemade raspberry cream white chocolates from Only Crumbs Remain. Not only do they sound delicious, but they look so professional too. Perhaps not the thing for really cold weather, but the chocolate peanut butter ice cream sundae I made to celebrate my blog’s 9th birthday can be eaten with relish at pretty much any time of the year. One day I’m going to master the art of piping, then I too can make something as pretty as these vegan chocolate hazelnut cupcakes from Curly’s Kitchen. These fruit and nut chocolate truffles look so good, but when I found out the ingredients I was positively drooling. I’ll let you find out what’s in them over at Gluterama. I have a thing for dates and really can’t resist them. Hmm, there seems to be quite a few things I find irresistible. Well these date and chocolate cookies from Apply to Face Blog are going straight onto my “must make very soon” list. And with Easter very much in mind this month, here’s gorgeous recipe for crème egg brownies from Elizabeth’s Kitchen Diary. They are the best apparently and gluten-free too. And for another crème egg special, why not try this slow cooker crème egg shortbread from Baking Queen 74? Yes, you read correctly. Lucy is up to her slow cooker magic again. And to finish off our final 13 chocolate recipes, we have classic flavours and an indulgent vegan treat – vegan chocolate orange cheesecake from The Baking Explorer. Kat even made her own chocolate orange segments. 13 Chocolate Recipes. PIN IT. What a great selection of recipes! Baking is a great activity to do on snowy days. Me and Master Spice were at home today and so made some chocolate covered doughnuts. I love the look of Jenny’s chocolate covered biscuits this month! Ooh they do sound good Corina. Baked or fried? Jenny’s biscuits have my name written all over them. It’s freezing cold over here too. Very unusual, esp. when it’s already SPRING! These chocolate treats look marvelous! Yes, I think 1 March was our coldest day – not right at all! Thank you for hosting this delicious link party, all the entries look so appealing! I did include a link to your blog, but I mentioned several other links as well, which is probably why you missed it (I answered your comment on my blog before checking if the link was there). If you would like me to include your badge I am happy to do so with the next recipe except I can’t find the code. Hi Monika. Thanks for letting me know and sorry to put you to the trouble. Badge is nice, but by no means obligatory. Chocolate heaven! I’m going to have so many chocolate recipes for this month! Johanna, everyone’s been raving about your tree house cake. You’re the most creative out of the lot of us. Hahaha Jo, you’ve made me laugh out load. I have a rather horrid feeling I might have my fat pants on far too often. Seeing all of these yummy recipes this month is a little bit like torture because I’ve given it up for lent. I think I’m going to need to make all of them to eat when I can! Oh well done you Cat. That’s quite a feat. Easter’s not so very far away now, so hang on in there. Those cookies are a real winner. They are on my “I really mustn’t forget this recipe” list. It’s quite astonishing how many different recipes there are using chocolate. After all these years of hosting #WeShouldCocoa, I’ve rarely come across the same recipe twice.